A discussion of the timing of the offer of reconciliation from the Pope to the Anglican Church. In a extraordinary offer to the members of the Anglican Communion, the Vatican announced on Tuesday Oct 20, the Feast of St Paul of the Cross, that it is establishing a special arrangement that will allow Anglicans to join the Catholic Church while preserving much of their liturgy and spiritual heritage, including an open invitation to its priests who are currently married. The Anglican Church was formed in 1534, when England's King Henry VIII was denied a marriage annulment, and proceeded to initiate a formal break from the Catholic Church. In more recent times, Anglicans and Catholics have made attempts to reconcile, but Tuesday's move is an extraordinary leap in the reunion of the Anglican Communion with the Catholic Church. In establishing the new structure offered to the Anglicans, Pope Benedict XVI is responding to "many requests" from individual Anglicans and Anglican groups -- including "20 to 30 bishops," said Cardinal William J. Levada, head of the Vatican's Congregation of the Doctrine of Faith. The official declaration was on October 20, the feast day of Saint Paul of the Cross, as celebrated in the USA (Oct 19th in the Universal Church). 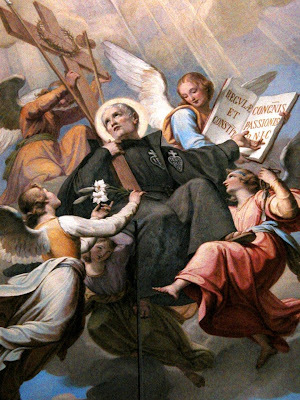 Though Saint Paul spent his life in Italy, the Catholic Encyclopedia entry for St Paul of the Cross states that "For fifty years he prayed for the conversion of England, and left the devotion as a legacy to his sons." In 1720 St Paul of the Cross made a 40 day private retreat alone in preparation for beginning his religious life. During this time of extraordinary fasting and prayer Paul made some entries in a prayer journal (diary) concerning his prayer intentions at this time. On December 26, the feast of St Stephen, he prayed "for the people of England and its neighboring Kingdoms". "I had a particular impulse to pray for the conversion of England, especially because I want the standard of the holy Faith to be erected, so that there will be an increase of devotion and reverence, of homage and love, and frequent acts of adoration for the Blessed Sacrament, the ineffable mystery of God's most holy love..."
"Father Dominic [Barberi] and his companions came in the spirit of Apostles without gold or silver, without scrip or staff or shoes or two coats.....They took possession of Aston Hall, near Stone, Staffordshire, [England] on 17 Feb., 1842, and there established the first community of Passionists in England. At the time of the arrival of the Passionists there were only 560 [Diocesan] priests in England and the distressful state of the Church there may be learned from the Catholic Directory of 1840. The Passionists with Father Dominic at their head soon revived without commotion several Catholic customs and practices which had died out since the Reformation. They were the first to adopt strict community life, to wear their habit in public, to give missions and retreats to the people, and to hold public religious processions. "They gloried in the disgrace of the Cross, were laughed at by Protestants, warned by timid Catholics, but encouraged always by Cardinal Wiseman. Their courage became infectious, so that in a short time almost every order now in England followed their example." In conclusion, perhaps the timing of Pope Benedict's offer to the Anglicans was unintentional, simply a coincidence, but its appropriateness on the feast of St Paul of the Cross is nonetheless remarkable and fitting.